Rafael Nadal is officially the Spanish flag bearer at the London Olympics. 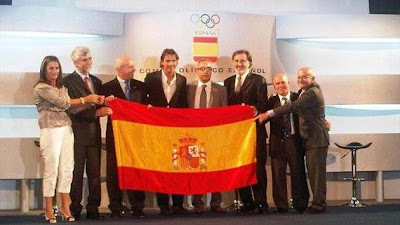 He attended the handover ceremony in Madrid earlier today. 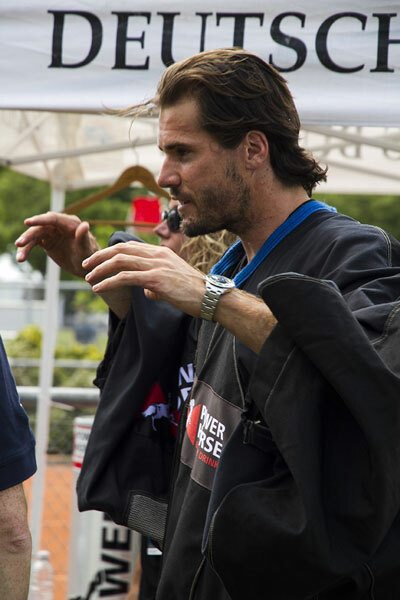 The event will kick off in two weeks time. Surprisingly Andy Murray doesn't reward himself with a vacation after a great final at the Wimbledon last week. 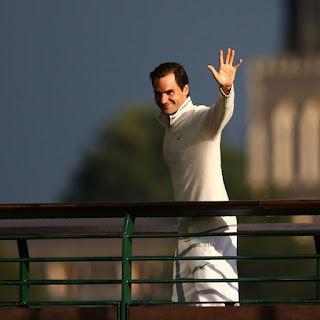 While Roger Federer, the eventual Wimbledon champion is spending his vacation at Sardinia, Italy with wifey Mirka, Andy Murray was spotted under the rain with girlfriend Kim Sears as they went shopping on West London's Kensington High Street. Hope his luck will change for the better soon. Daniela Hantuchova receives a lot of coverage recently after being featured in the latest ESPN magazine Body Issue. 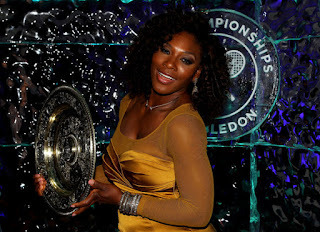 However she was overshadowed by Maria Sharapova at last night's ESPY Awards. 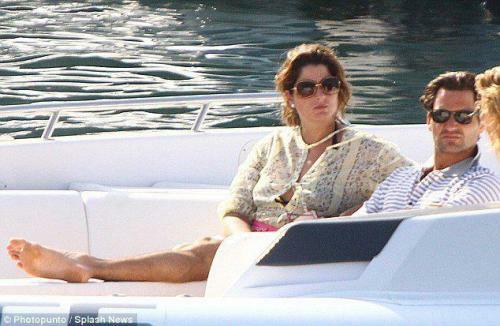 After his historic Wimbledon win, Roger Federer spent his vacation with his wife Mirka on a day-long yacht cruise, setting sail from Porto Cervo off the northern coast of Sardinia, the Italian island. The couple left their twin daughters Myla Rose and Charlene Riva behind, enjoying some well-deserved time together before the Olympics kick off on July 27. If Roger Federer is a Greek god, then Maria Sharapova must be a Greek goddess. The beautiful Russian tennis star hits the red carpet at the 2012 ESPY Awards held at Nokia Theatre L.A. Live on Wednesday in Los Angeles. Dressed in a blue J. Mendel Grecian gown, Sharapova was nominated for Best Female Athlete. The award eventually went to basketballer Brittney Griner. 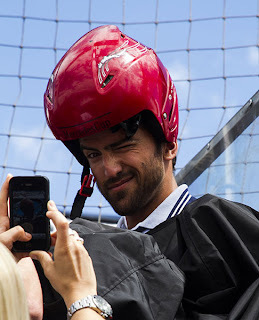 “I love attending the ESPYs – such a night of glamour! 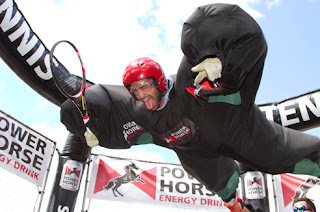 It’s a rare occasion to have so many talented athletes in one spot,” Maria exclusively told JustJared.com. Sharapova will be her country's flag bearer at the Olympics. Daniela Hantuchova arrived at the ESPN Magazine's Body Issue 2012 bash fully clothed. The event was held at the Belasco Theater in Los Angeles. Yesterday, we reported that the lovely Hantuchova is the latest tennis player who has been chosen for the ESPN magazine’s signature Bodies We Want issue. 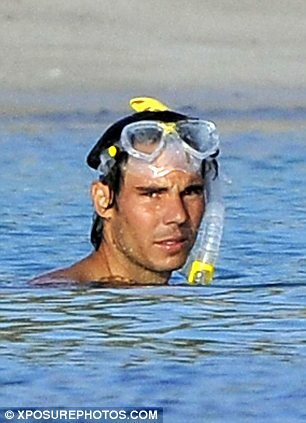 A continuation to his shirtless vacation at Sardinia, Italy, Rafael Nadal was spotted snorkeling with some friends yesterday. Nadal showed off his toned body in a pair of bright red swim shorts as he grabbed a mask and a pair of flippers before venturing into the water. Daniela Hantuchova is this year's tennis star to make the annual Body Issue on the ESPN magazine. The Slovak previously posed in the Sports Illustrated Swimsuit Issue in 2009. Other tennis stars who have been featured in the Body Issue are Wimbledon champion Serena Williams (2009) and Vera Zvonareva (2011). For online tennis betting odds for women's tennis, do visit some of the popular sports betting sites. Click here for the full list of athletes who pose in the buff for ESPN magazine’s signature Bodies We Want photo portfolio. 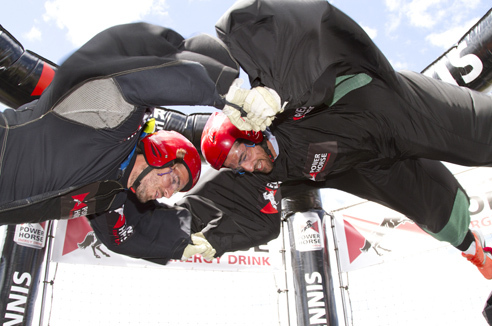 Tommy Haas and Janko Tipsarevic tested the limits of gravity during a photo call for the Mercedes Cup in Stuttgart on Monday. Tipsarevic is the top seed at the clay court event. ... partying hard with the ladies. Don't you just love club pictures? 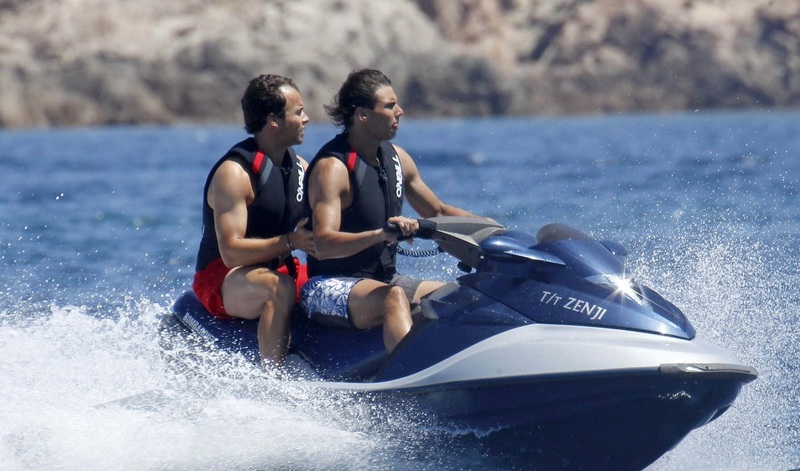 There's no better way to relax for Rafael Nadal than going out to the sea. 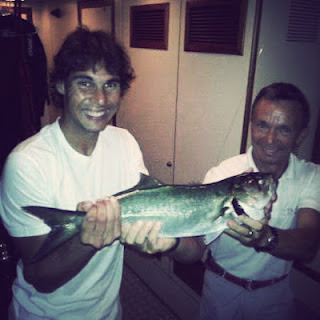 Yesterday, he congratulated Roger Federer on the Wimbledon victory and Andy Murray for the great performance on Facebook while showing off his catch - a huge sea bass. Meanwhile, Just Jared reported that Nadal was spotted having a vacation at Sardinia, Italy on Monday. For more pictures, click here. 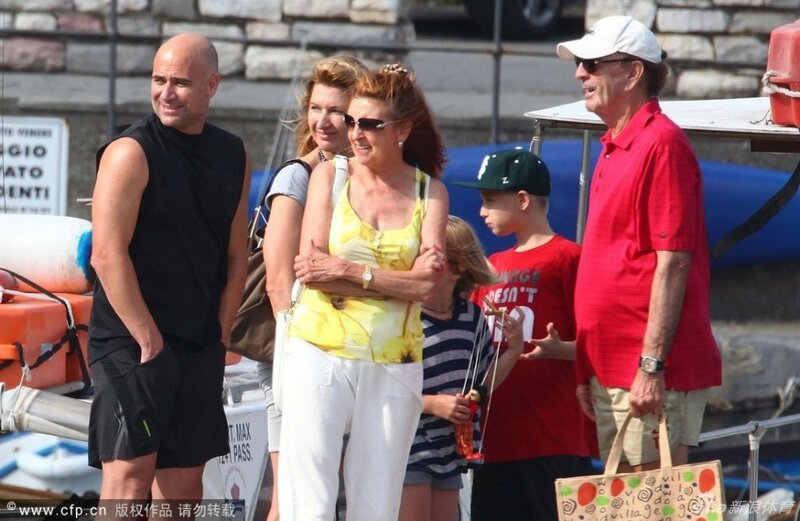 After attended the Wimbledon on the Fourth of July, the First Couple of Tennis Andre Agassi and Steffi Graf were spotted having a vacation with their family in Italy. 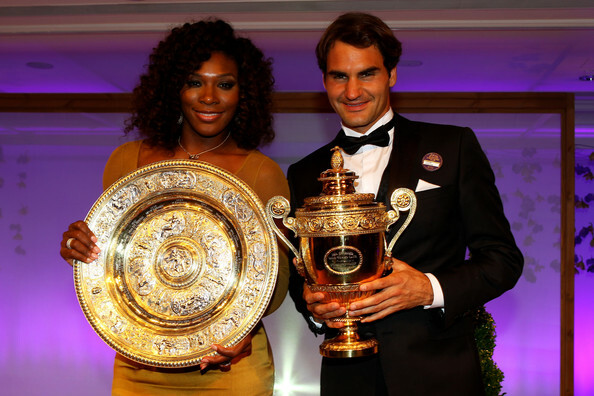 Roger Federer Serena Williams attend the Wimbledon Championships 2012 Winners Ball at the InterContinental Park Lane Hotel last night. 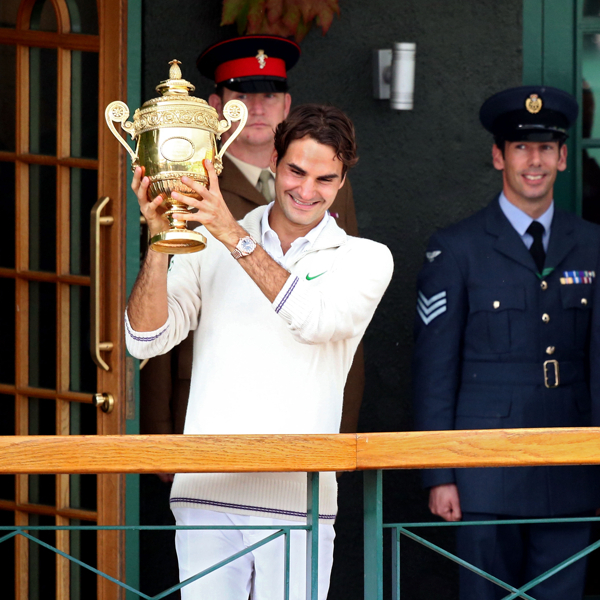 It is Federer's seventh Wimbledon title and Williams' fifth. Both of them are 30-year-old. Just like a king, Roger Federer met the fans, waving at them after winning his 7th Wimbledon final today.